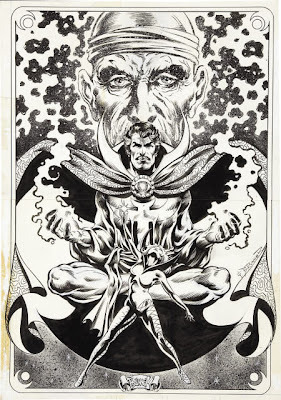 One of my favorite characters of all time is Doctor Strange, Sorcerer Supreme! Recently, Dr. Strange has fallen on hard times. And while it is incredibly frustrating for me to read writer Brian Michael Bendis’ current dismantling of the good doctor in the Avengers titles, I have decided to celebrate the character the way I shall always remember him. That is, you know, supreme! Above we see Geof Isherwood‘s delightful rendition of Stephen. You can practically hear the rustle of the Cloak of Levitation and the crackle of magical energy! I also like how muscular Stephen’s legs are! They are a great contrast to his extra flouncy sleeves. The gestures are spot on and Stephen looks like a force to be reckoned with! Love love love this image! Alan Davis gives us a sleek (as his is way) look at the Sorcerer Supreme fighting some tentacles. How Chthulu of him! Stephen is focused, but not stressed. He looks in control. I like the extra elongated sharpness of Stephen’s cloak and the immensity of his Eye of Agam0tto. All the better to see you with, my dear! Frank Brunner draws Stephen like no one else! His pencils are so detailed as to leave nothing to the imagination! His work on Dr. Strange shall always be my favorite for sheer lushness! Here the skull of death hovers over our mystic as he advances to his next challenge. More Frank Brunner goodness (as if you weren’t already convinced of his artistry)! Here we have the Holy Trinity of The Ancient One, Stephen and Clea! And here’s Paul Smith’s take on the Master of Mystic Arts. 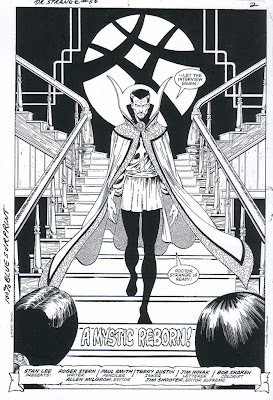 Smith’s Strange is taller, more gaunt and looks a bit older than some rendtions (but truer to his first appearance as we shall see below). I almost called Stephen haggard, but that’s not very nice, so let’s move on. Nice background design elements on this page! Finally, the man in his first appearance as designed by his creator Steve Ditko! 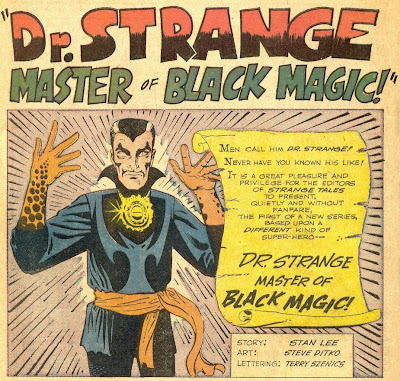 I guess the title of Master of Black Magic was too occult for some folks, so Sorcerer Supreme was coined later. Besides, the alliteration is catchier, in my humble opinion. Alliteration always makes things better. Dr. Strange looks pretty old here. Those sunken cheekbones indicate he’s certainly no spring chicken. His tunic skirt is short, his little pointy collar picks up the “v”s in his eyebrows and widow’s peak as well as the spirit emblem on his chest. And that’s a pretty hefty Eye of Agamotto, too! So you see, dear reader, how accurate Paul Smith’s rendition really is. Even though other depictions have Stephen as being more physically demonstrative, I prefer him being thin and lanky. It simply makes more sense to me. Of course, it also my opinion that we need no other Sorcerer Supreme aside from Stephen and that’s not what’s happening these days in the Marvel Universe. Yes, I’m a bit bitter. I’m still upset about Scarlet Witch’s character assasination (especially after Kurt Busiek redeemed her so gracefully) and the death of the Wasp in Civil War. So this new storyline where Stephen is cast as a failure leaves me unhappy. Of course, there are many stories that depict the hero of magick that I love, so it is obviously time to get those comics out of their polybags and reread them. If you like the artists represented above, I heartily suggest you check out their websites and their work! By the Crimson Bands of Cyttorak, make it so!